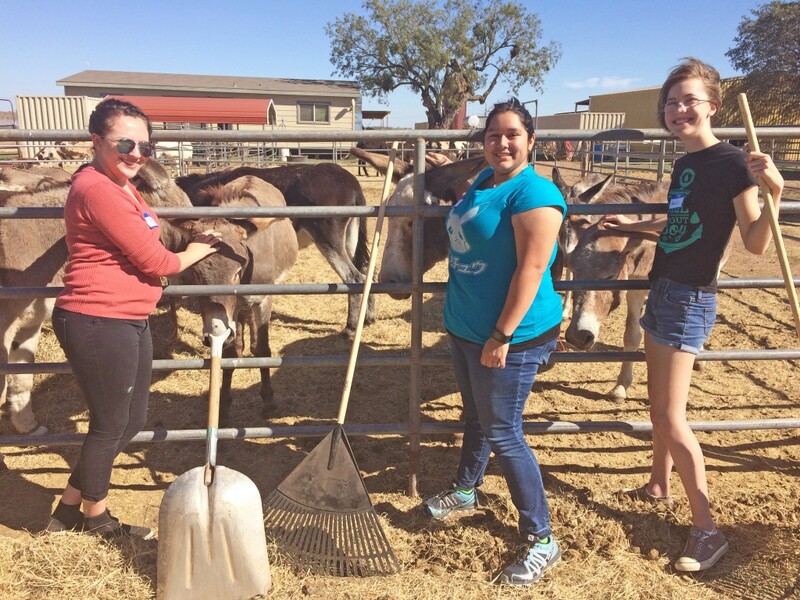 Students Who Serve took a group of volunteers out to Peaceful Valley Donkey Rescue on Nov. 2 to help some very cute four-legged friends. Peaceful Valley Donkey Rescue is a non-profit organization whose mission is to provide a safe and loving environment to all donkeys that have been abused, neglected, or abandoned as well as wild burros under threat of destruction. This was the second time that freshman Arabella Pena had done volunteer work for this organization. "Last time we picked up manure and hay, we gave them [the donkeys] treats, played with them and helped rehabilitate them," Pena said. Around 2 p.m., the volunteers were bussed out to the location a few miles northeast of San Angelo. "We like going out there, for one, because it’s a fun little out of town trip. Also, it’s just fun working with Donkeys," Student Life Graduate Assistant Morgan Barker said. The students broke up into to two groups upon arrival and got to work cleaning the donkeys’ pens. The full-time workers explained that although it wasn’t very glamorous, shoveling manure was a necessary part of their daily routine. Next, the volunteers helped stack hay and spread fly bait around the perimeter of the pens. Junior Kira Wells was one of the volunteers who wasn’t afraid to get her hands dirty. "I’m an Agriculture major, and I love animals," Wells said. "I helped through Students Who Serve before at the nature center." After the hard labor came the fun part; playing with the donkeys. Donkeys that are rescued by Peaceful Valley Donkey Rescue can be in need of psychological healing as much as physical healing. This involves providing them with positive human interaction, especially for the ones up for adoption. The mammoth donkeys proved to be especially playful, despite their size. They excitedly greeted students who approached their pens, reaching out their heads to be pet. Some of the more mischievous donkeys even attempted to steal water bottles from their newfound pals. Another opportunity for students to help out community organizations will take place later this month. "Angelo Serves will be on Nov. 16 on a Thursday," Barker said. "That is one of the two Angelo Serves we do this semester where we get a bunch of students together and spread them out all over the community. We usually have anywhere from 80 to 100 people show up." Barker said Students who serve is also working on a winter break trip. "It’s not concrete yet, but we are striving to have a trip to Houston."